Firstly, I’m writing this post a week and a half after the fact. For purposes of documentation and consistency, I’m dating this post on the day I’m writing about, as I have done in the past in will do in the future. Just wanted to be clear on that -now onto Pilot Mountain! Sarah and I have both driven past Pilot Mountain on dozens of occasions and have known it to be one of the pillars of the North Carolina State Park system. But, amazingly, neither of us had ever been. For that reason, as we start out on our journey of visiting all of North Carolina’s state parks, we wanted Pilot Mountain to be one of the firsts. A beautiful October weekend seemed like the perfect time to give it a try. Our initial plan was actually to stay a night at the campground. The day before, we made the decision nix that as the forecast was predicting overnight temperatures below freezing. As it turns out, this wouldn’t be the only change of plans that the day would bring us. When we arrived a Pilot Mountain State Park, we weren’t able to park at the campground like we had hoped (due to large crowds and no more parking spaces according to the ranger), and instead had to park along the road outside the park gates. 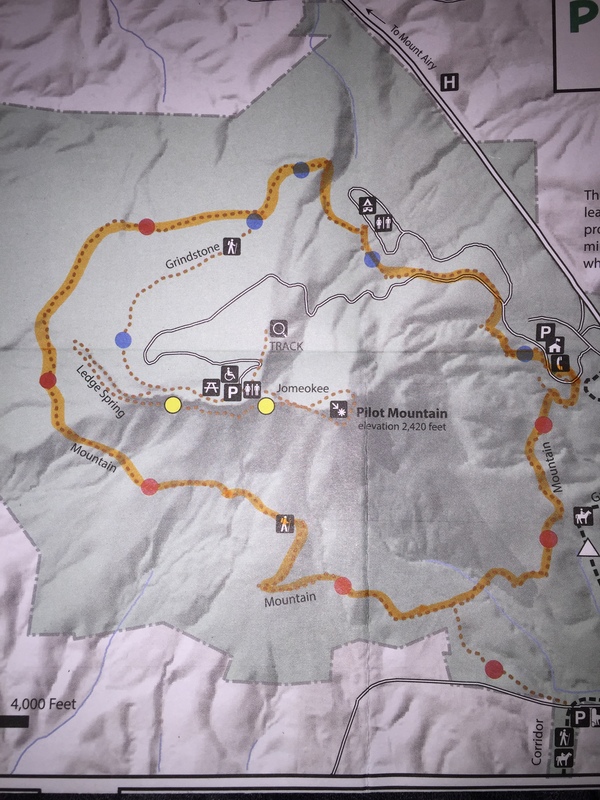 I pulled up the park map from newly download NC State Parks App (this would prove to be a mistake), and saw that there was a trail right by where we parked that should lead us to the campground where we would begin the 2.5 mile hike to the top of the mountain. We started the hike, and after a mile or so I got a little weary that we didn’t seem to be anywhere near the campground. I pulled out the GPS and could see exactly where we were, but there didn’t appear to be any trail on the map even though the trail was clearly marked in front of us. I gently broke the news to Sarah that I knew exactly where we were, but wasn’t exactly sure where we were going, though I assumed this trail would eventually lead us to the top in a couple of miles. As you can see from Sarah in the picture above at this point we charged ahead. The trail was beautiful and we were feeling great. A mile or so later, a couple passed us and we chatted with them. They let us know that we were on the newly redone Mountain Trail – a trail that encircled the entire mountain before ending back at the campground 4.5 miles later. They weren’t sure, but they assumed it ran into Ledge Spring Trail, which would take you to the top, but would also add a couple more miles to the trip. I did the calculation in my head and realized it was probably going to be at least 6 miles to the top, and at least another 2.5 to get back down. The picture above was taken not long after this revelation. Sarah was starting to get a little testy, but I told her if we could make it to the top, that we could hitchhike on the way back down. When we passed the same couple again coming back down the mountain, I knew what they were going to say before they spoke. There wasn’t a way to get to the top, the trail just circled around to the campground, around the mountain. At this point, it was actually somewhat welcome news. We had the genius idea of finishing the hike around the entire mountain, and then driving to the top! At the very end of the hike, we stopped in the park office where they did have freshly printed maps of the new trail locations. When it comes to maps, paper is better. As it turns out, though the hike was longer than we intended, and we didn’t hike to the top, it was actually a very nice hike. The trail was not crowded at all, unlike the main trail to the top which we saw packed with people. the trees. It w as also just a wonderfully cool day to go for a long hike. Once we drove to the top, it was late enough in the afternoon that the crowds had shrank some, and we didn’t even have to wait to park (we were told the wait earlier in the date was over half an hour). The views at the top were phenomenal and we were so happy we had finally reached our ultimate destination. The sky was completely clear. We could make out all kinds of landmarks – in addition to Fancy Gap, Hanging Rock, Kings Mountain, Winston-Salem, and Greensboro we even were able to see some buildings in the far distance which had to be Durham. The trail map of what we hiked is below. For anyone passing through, not looking to hike, but with a half hour to spare, I highly recommend driving to the top. You won’t regret it! Or if you have a couple hours, hiking from the campground to the top would be a nice 4-5 mile out. Alternatively, you could actually do the hike we did and take the Grindstone Trail (you pick it up just outside the campground) to the top, so you would really do the entire park, and it would probably be around 9 miles. Sarah and I will definitely be back to this park, not just to witness the views at the top, but there is another section of the park along the Yadkin River that we want to see. On our way home from Pilot Mountain, exhausted from the hike, we decided to check out a new brewery. I’m thinking this whole hiking and brewery combo might become a bit of a theme… The brewery we selected is called Small Batch, and it is in the heart of downtown Winston-Salem. It’s philosophy, as the name suggests, is making small batch beers, focusing on experimentation, rather than focusing on creating staple beers. I got a flight. They also were able to provide (pregnant) Sarah with a ginger beer, which she very much enjoyed. Easily my favorite was the Mr. Lemon Man IPA, and the Cucumber Basil Saison was good too – I think I would have enjoyed it even more were it Spring. A little research led me to discovering that the Mr. Lemon Man IPA used to be called Limonhead, and it is a rare beer that they do make over and over again. We also had some very delicious food. Particularly, the pumpkin bread pudding! Overall, we both really enjoyed the atmosphere of this place and the friendliness of the staff. If you find yourself in Winston-Salem and have already done the foothills thing – this is a great place to catch a game, sample some beer, or grab a bite to eat! Prices: The Flight was $8 which I thought was a little high for only 4 beers. Most pints are $5. 12 Weeks… And It’s My Turn!